For most fifteen year old boys, the end of summer vacation is usually spent enjoying their last few days with friends, back to school shopping, and sleeping in. For Eli Schechner from Short Hills, the last week of summer was spent volunteering with his mother, grandparents and sister at Allie’s Camp, a weeklong day camp for children and teens with special needs. Allie’s Camp is run by the Friendship Circle, a volunteer based community organization serving families with children with special needs. The camp is named in the memory of Allie Rosenfield, a former camper who passed away from complications resulting from cerebral palsy. The day camp takes place at the end of the August, when summer programs have ended but school has not yet begun. It allows parents who have children with special needs to go to work or run errands, knowing their children are being well cared for in a structured environment and having a great time. The Schechner clan traces their involvement in the Friendship Circle, and specifically in Allie's Camp, to Eli’s older sister MayaBea, who began visiting Alie Rosenfield via the Friendship Circle’s Friends at Home program, which matches up teen volunteers with children with special needs for weekly home visits. When little Allie passed away in April of 2006, it was "the worst day in MayaBea's life," explained her mother, June. Although MayaBea was devastated, she returned to the Friendship Circle after just a few months and asked to volunteer again. At about the same time, Rabbi Zalman and Toba Grossbaum, the directors of the Friendship Circle, approached the Rosenfields about renaming the camp in the memory of their daughter, only to find that Allie's parents had already come up with the same idea. 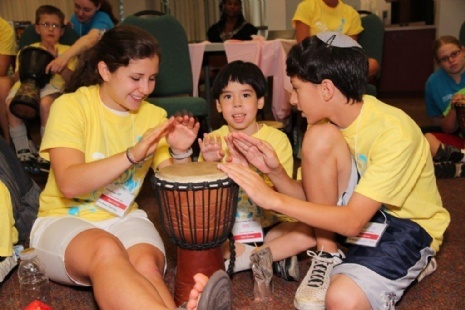 "Camp was the program she really connected with," said Rabbi Grossbaum. To this day, the Rosenfelds remain actively involved in the camp and also have three generations of their family volunteering throughout the week. "I think it's very meaningful for them to see the joy their daughter had live on in the camp," said Grossbaum. MayaBea has since graduated and headed off to college, but what was one girl’s volunteer project quickly turned into a multi-generational family effort. Mayabea’s mother began volunteering as group leader at Allie’s Camp in 2006. “It’s became the highlight of my summer!” said June. Every year since, the Schechners have returned from summer vacation one week early to volunteer at Allie's Camp. 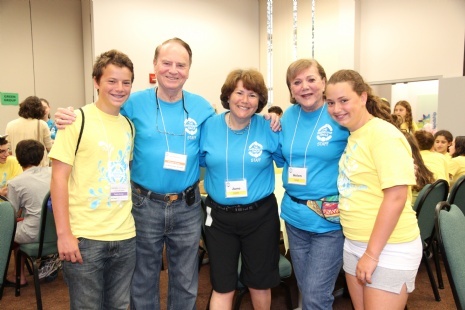 Last year, June's own parents, Helen and Len Glaser, of West Orange, caught their grandchildren’s infectious enthusiasm and began volunteering at Allie’s Camp as well. Helen Glaser, June’s mother recalled her proudest moment as a volunteer: "One of the children called out to me by name while on a ride at the amusement park, with a huge smile on his face, to show me what he was doing." As a parent of three volunteers, June has seen firsthand the impact that volunteering with the Friendship Circle can have on a teenager. "My teens have a positive attitude,” she said, “and I think that's because the Friendship Circle is a way of life for them." She proudly describes her son spending his lunch break with special-education students, and her daughter Ruby publicly standing up for a boy who was being teased by classmates. She encourages other parents of volunteers to come volunteer themselves, or at least to sit in and see the kind of miracles their children are creating. The Schechner children were happy to talk about how the Friendship Circle has changed their outlook on people with special needs. "I've been involved for so long that everyone feels like a friend, it just feels normal and fun,” explained Ruby, who also invited five of her friends with special needs to her Bat Mitzvah. "It was really awesome when I was standing on the deck of the Intrepid with Jake, Ben and Caleb, scoping out the planes," Eli said casually, without differentiating which of these teens were his fellow volunteers and which were campers. "When I’m at Friendship Circle, it’s not about volunteering," he explains. "We have a great time and hang out with real friends." It is teens like these who provide the energy and excitement that makes Allie's Camp the highlight of the year for many of the children who participate. Although there are several behavioral therapists on staff to help tailor activities to each child's needs, the real magic of Allie's Camp is the fact that the counselors are not therapists, but ordinary teenagers. There is no Individualized Education Plan and no diagnoses. For a week at the end of the summer, it is just a bunch of kids doing arts and crafts, swimming, and singing, like all other camp kids across the country.